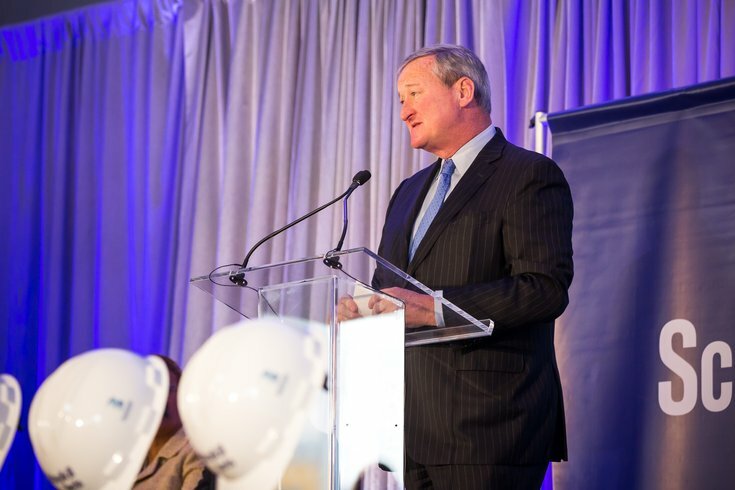 Philadelphia Mayor Jim Kenney spoke on Wed. Nov. 8, 2017, at 30th and Market Streets at the official groundbreaking of the Schuylkill Yards development in University City. Mayor Jim Kenney proposed a property tax increase in his annual budget address on Thursday, pitching the hike as an investment in Philadelphia's school system. Over the next five years, Kenney seeks to direct an additional $980 million to the Philadelphia School District, which is facing a budget deficit of nearly $1 billion. To cover that shortfall, Kenney intends to raise property and real estate transfer taxes. He also suggested lowering the city's wage tax at a slower rate. Under Kenney's proposal, property taxes would rise by 6 percent and the real estate transfer tax would increase by 8.5 percent, according to the report. For the average homeowner, the property tax increase would amount to an additional $95 per year. For residents enrolled in the Homestead Exemption program, it would mean another $70 per year. "I know for many residents, this will be a sacrifice," Kenney said. But he said the funding will support a collection of programs needed to improve the district's graduation rate, literacy levels and college readiness. The school district projects a $1 billion deficit over the next five years. With the dissolution of the School Reform Commission returning district control to the local level, Kenney has pledged to cover much of the shortfall. "There is nothing left to cut," Kenney said. "There is no one else to turn to. While we continue to press the commonwealth to meet its constitutional requirement to fund schools adequately, we can no longer afford to wait for other people to act." The Kenney administration projects the real estate tax hike to generate an additional $475 million, while the real estate transfer tax increase will bring in another $66 million. Reducing the amount of planned wage tax rate reductions will provide the district with another $340 million, Kenney said. Additionally, the city will contribute $20 million annually from its general fund, generating another $100 million. "All told, this will mean an additional $980 million to the children of Philadelphia over five years," Kenney said. The additional funding will enable the school district to implement an action plan that includes upgraded classrooms, specialized reading coaches, expanded college and career readiness programs, increased bilingual support and school safety investments. "All of these efforts will take years to fully realize their worth," Kenney said. "But we expect to see steady and incremental progress each year." Kenney vowed to take such actions while protecting low-income homeowners. He called for a $4 million boost to the Philadelphia Land Bank and pledged to expand housing counseling and outreach with $2.5 million in foreclosure prevention programs. Kenney also detailed proposed funding to cover several other city priorities. He seeks to invest $100 million over five years to boost the police force to 6,500 officers, a level not seen since 2009. And he wants to invest another $54 million to bring firefighter and paramedic staffing levels to 2,600 – a 24 percent increase since he took office. His budget proposal includes $60 million to redesign streets and implement traffic calming measures – policies included in the city's Vision Zero plan. The budget also includes $20 million, spread out over five years, to combat the city's opioid epidemic. "I only wish we had sufficient resources to fully address every challenge our city faces," Kenney said. "But, unfortunately, we don't. This spending plan is lean. We have combed through every part of government looking for new efficiencies." Two years ago, Kenney pushed a controversial soda tax through City Council to raise funding for universal pre-K programs, community schools and park upgrades. Now, he's asking council to approve property taxes, which were last increased in 2015 – Mayor Michael Nutter's final year in office. Nutter asked for a 9.3 percent increase during his final budget address as he sought to raise $100 million for city schools. But the tax proved unpopular with city council and he settled for a 4.5 increase. Combined with hikes to off-street parking and the use and occupancy taxes, the city projected raising an additional $70 million for the district.